Tawhai has excellent purpose designed facilities to ensure that your children's education is the best it can be. Parent Tutor Reading Room – a space where trained volunteers support students struggling with reading. The school hall is used weekly for either syndicate or whole school assemblies. The digital audio and visual equipment means it is often used for Jump Jam (a form of aerobic exercise), learning workshops, art classes and cultural group practices. The hall also hosts parent information evenings, school discos, and community group meetings. Kelly Club is a before and after school care facility that is on offer to parents. We provide a quality programme in safe and fun surroundings. Our friendly staff are passionate about working with children. Our programme focuses are around sport, cooking, art and craft activities as well as structured “free time” after a busy day a school. It gives the children the opportunity to extend their learning outside of the school classroom. The boardroom is located next to the school office and is regularly used to host various meetings, learning support lessons, or as a teacher workspace. The boardroom has a large table with 8 chairs and French doors, which open out, on to a courtyard. The school offers extensive sporting spaces including two large fields and two hard court areas marked for netball, basketball and other games such as hopscotch and four square. Shaded outdoor-seated areas provide space for students to eat lunch, relax or work collaboratively on learning tasks. There are two separate adventure playgrounds. The junior playground equipment is suitable for our Year 1-3 students and is located at the end of the junior courtyard next to Room 11. The senior playground equipment is more challenging and suitable for the Y4-6 students. It is located on the top terrace behind Room 5. Students take reading books home each night. A sturdy bag for these books is part of the junior school stationery order. Once students are reading independently and fluently, they are able to make choices for themselves about reading material. We try to offer a wide range of reading choices for students, and our libraries, both school and community, are wonderful resources for encouraging a life-long interest in reading. 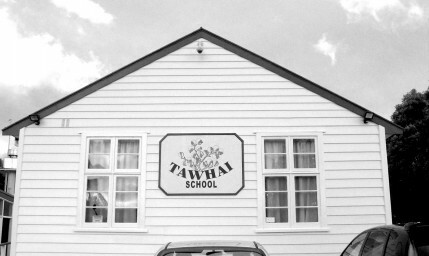 Tawhai School is the best!